I did, however, make this fun CAS card using the Your Next Stamp's Mini Envelope die along with the set of Whatnot Sentiments Four. I cut the panels out using the stitched rectangle layered die set and then cut the mini envelope using some patterned paper from MME before using the small heart die from the Soy Awesome set to cut out the different hearts. The hearts were placed to fall out of the envelope and the sentiment stamped directly onto the panel. I completed the card by adding some fun YNS silver glitter gumdrops. Thank you for stopping by today to take a little peek and appreciate your comments! Have a great Friday! The day has arrived crafty peeps! It's the July new release for The Cat's Pajamas! Woot woot! If you arrived from Wendy's blog, then you are in the right place. Aren't the projects you have seen by the Kitty Cat pack amazing?! They have really knocked this release out of the park. For my first card, I am using my favorite set of Seas The Birthday and made a CAS card. Using the Stitched Wavy Cut Up, I made a side border before stamping, coloring the image, and fussy cutting it out to pop up over the ink sponged area. I then added some dots in a matching Copic color to add to the sponged area and finished it with some enamel dots. The sentiment was stamped directly onto the main panel. For my second card, I am using the super fun new set of Show Me The Monkey. This little guy is adorable. Be sure to hop on over to Nancy's blog to see more of this fantastic release. Thanks so much for stopping by and be sure to leave a little love as you hop along! Have a great Tuesday! I hope you all are having a great weekend so far and have been enjoying all these fun sneak peeks from The Cat's Pajamas! I know my fellow Kitties have inspired me with their talents and creativity! Today is Day 6 and I just love this one. It is called Stoked and perfect for that beach-going, surfer, sun loving person in your life. I also got creative in using the TCP Mustache cut ups for the waves and seagull. The patterned paper is from Authentique's Seaside collection while the image was stamped, colored in with Copics and fussy cut out. The back panel is the Framed Up cut ups while the sun is from the soon to be released cut up of Country Fair. I completed the card with some jute tied in 2 knots and added to the bottom of the frame for a little extra ocean flair. Be sure to join in on the fun Tuesday for the Pajamas Party! There you will get to see more sneak peeks from this release along with chatter and games. You don't want to miss out! And don't forget to comment during this fun week of peeks! You can win a gift certificate to the TCP store - Are you in it to win it?! Today is day 5 of the TCP July Sneaky Peeks and it is a set called Simply Stacked Sentiments. I just love sentiment sets and find myself having many of them. I once again combine this set with the new tall and thin pop up die to make for a fun birthday card to give. For the outside, I used the He Said She said new cut ups along with the banners from the new Country Fair cut ups. 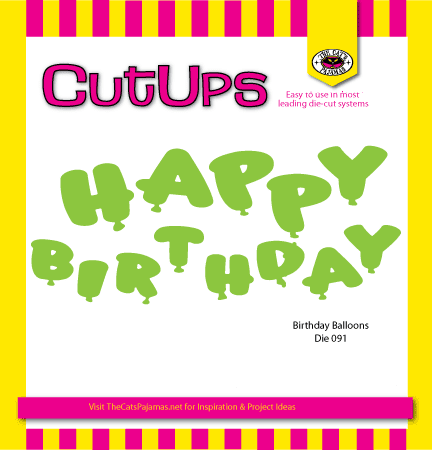 I used acetate to attach the balloons onto so that it has a little give when opened so it would wave a bit like a balloon. I used the grass from the Country Fair Cut Ups and some paper flowers through out. The card was completed with a few more banners at the top. Don't forget our Pajamas Party is coming up and you sure don't want to miss it! Join us for games, chatter, and fun, along with more sneaky peeks from the Cat Pack. Earn a chance to win a TCP gift certificate just by commenting everyday during the sneaky peeks! It's day two of The Cat's Pajamas Sneaky Peeks of the July release! This set is hilarious and so much fun at the same time. 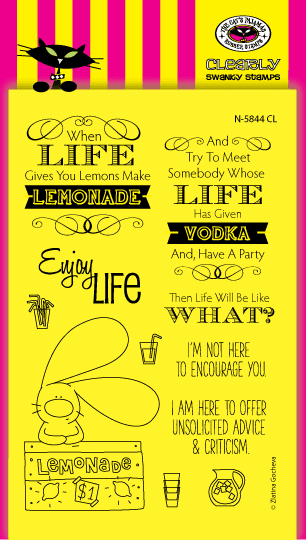 I can see many cards going out using this set to make someone giggle and brighten up their day- it's called Lemons. I just love this set and it makes me laugh! I colored the image with Copics and fussy cut him out to place him within the new Country Fair die. The patterned paper is from EP and the card was completed with some rhinestones. You don't want to miss all the fun and adorable creations the Kitty Cat Pack has created. Head over to the TCP Blog and don't forget to leave a little love. Because, are YOU in it to win it? You can win a $10 gift voucher to the TCP Store. And don't forget the most important and fun part of the whole release.... we hope to see you there! 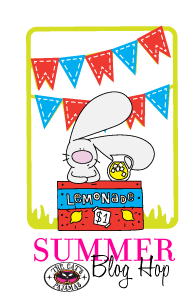 It's Feature Day with the Your Next Stamp DT and this day we've been challenged to keep Summer in mind. What reminds you of Summer? I instantly thought of ice cream and knew I wanted to create a card using the ever fun Cool and Sweet stamp set. For this card, I used two of the three ice cream images in the set to stamp throughout the main panel which I cut out using the stitched rectangle dies. Copics were used to color in the images before placing that over some patterned paper from MME and popping up the sentiment keeping a CAS look. The card was completed by adding some gumdrops from the Mermaid Fun collection. 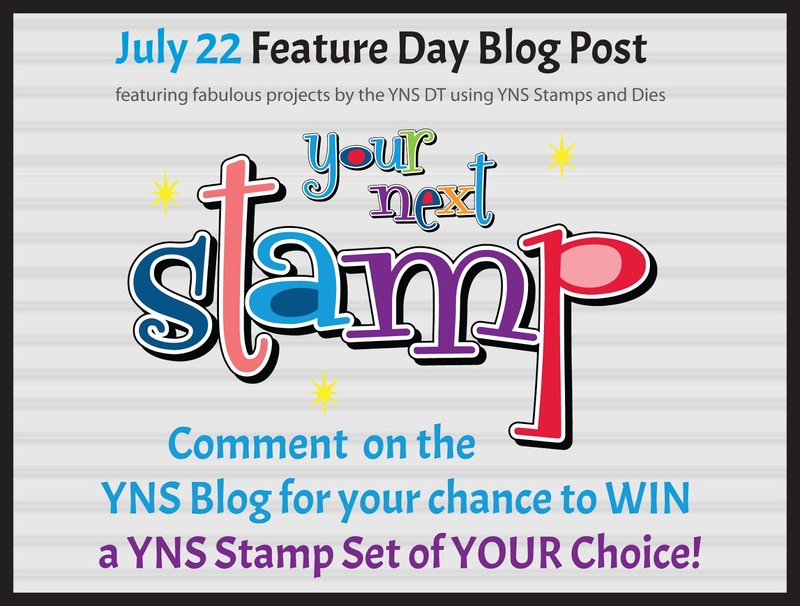 Be sure to stop by the YNS Blog to see all the fabulous creations from the DT and don't forget to leave a little love- You can win a stamp set of your choice!! Thanks so much for stopping by and make it a great day! TCPTUES295 And A SNEEKY PEEK! With this release, there will be fantastic pajama party you do not want to miss out on. Be sure to join in on the fun of discussion, games, and more sneak peeks of this super fun new release. Be sure to visit the TCP Blog for all the fun and creative peeks from the Kitty Cat Pack. Are you in it to win it? Comment during the fun new release blog hop and you can win a gift certificate to the store. As you can see, the TCPTUES challenge is Anything Goes. For my project and sneaky peek, I am using the new tall and thin pop up die along with the new set of Shake Rattle and Roll. Here is the front. Simple and ready for baby. When you open the card, it pops up and ready to showcase the adorable baby bunnies! 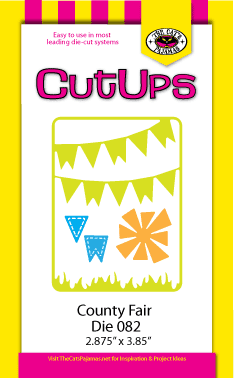 The letters are cut out using the same patterned paper from the front which is by Cosmo Cricket. Here is the close up of the pop up sections. The images were colored with Copics and fussy cut out to be placed on the pop outs. The sentiment was stamped directly onto the bottom base giving the back of the card plenty of room to write a personal note. Thanks for stopping in to take a peek into the new release! Be sure to play along in the current challenge to link up on the TCP Blog and share your fabulous creation. Have a great Tuesday! 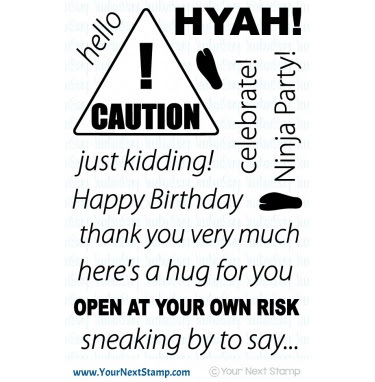 It's another Your Next Stamp Fun Project and today I am sharing with you a fun new die and stamp set released this month called Ninja Surprise. This is such a cute idea for that ninja lover that is sure to get a chuckle. For the front, I kept it pretty simple and with a black and white theme. And here is a look of the inside using the Ninja Pop Up die set in conjunction with the stamp set. How cute is this set? Doesn't it make for such a fun card? I used my ever neglected decorative scissors for the edge of the sentiment strip and corners of the inside panel before stamping the sentiments to be placed at the top and center. Thanks for stopping in and taking a surprise peek. 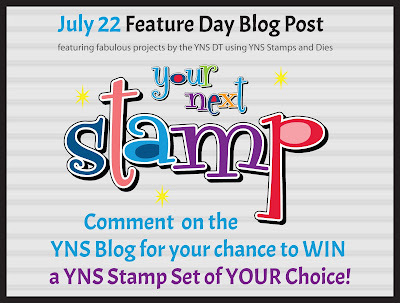 Be sure to stop by the YNS Blog for other great DT inspiration using this and other YNS products! Have a great weekend! There's a big sale going on right now over at The Cat's Pajamas Stamps! Check it out and stock up on your favorite items or those items you have been eyeing but just couldn't decide. It's the middle of the week already and what better way to finish it off than a colorful DT dare from Your Next Stamp! This months dare is to use floral in our projects. Perfect for the newest release of the Flower Ink Splatter. For my card, I used the new set of Celebrate in Color along with the Flower Ink Splatter stamp to create this CAS card. I stamped the flower splatter in the colors of the rainbow with Memento ink over the base of the card. Using the stitched rectangle layering dies, I added a frame to highlight the peacock once cut out and popped up. The peacock is not colored in with the exception of the markings to make a point of celebrating in color. (get it?) :) The finishing touch was adding various gumdrops and the sentiment colored in an ombre style again with the colors of the rainbow. Be sure to stop by the YNS Blog to see all the fabulous projects made by the DT and don't forget to leave a little love! 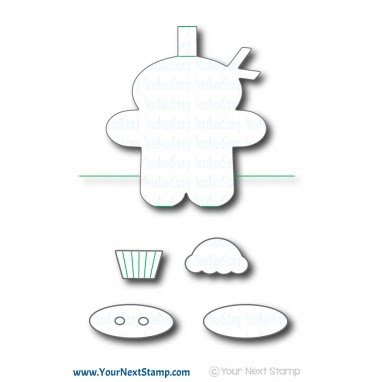 You could win a stamp set of your choice!! Thanks for stopping in and taking a peek. Make it a great day! Today is another new TCP Tuesday Challenge and this time it is a sketch brought to you by Tammy. It's a fun sketch to play with and be able to add a few touches to it. My card took the sketch for the most part as it shows, but I did add a few elements. My card is using the cute set of Travelin' Man along with the frame from the Stitched Fly Journal card without the word. I also incorporated the clouds in that die to be popped up. The image was stamped and colored in with Copics before cutting out the circle partially and then fussy cutting the front end. The patterned paper is from Authentique's Playful collection. Everything is popped up except for the frame and layers. The card was completed with some milky white rhinestones. A super fun sketch for you to play along with us and link up! You can have a chance of winning a TCP prize if chosen as the challenge winner. If you link up to an online forum, be sure to label it as TCPTUES294 so we can find it and see your beautiful creation! Thanks so much for stopping by and hope you have a great rest of the day!